Described as "Europe’s definitive guide to the top wealth managers, lawyers and advisers for HNW individuals", we are delighted to be included in the second edition of The Spear's 500. Listed under the Art Advisor's section, Frederick Mulder has been awarded the status of 'Eminence Grise', and is the only print-specific specialist listed. "Mulder has spent the 40 years of his career celebrating and promoting the diversity, originality and beauty of the printed medium, whether etching, lithograph or other technique. He started spanning the entire history of printmaking, from the 1460s to his day, but now he specialises in Picasso, whose prints often came out in editions of 50. That doesn’t make them easy to acquire, however, price aside: many prints ‘are still disappearing at an enormous rate into institutions’ who can’t afford original paintings or drawings, thus perhaps only half of an edition is still in private hands..."
After another successful year at Masterpiece London, we are delighted to share some photos of our stand showcasing, amongst others, our three stunning Matisse cut-outs and our Picasso prints and ceramics. The images were taken by photographer Francis Ware and also feature the elegant furniture of Chelsea-Wiltshire designer, Tom Faulkner. Last Thursday, five dealers went head to head as part of the Spear's Masterpiece breakfast debate, vying to have their object voted the Spear's masterpiece of Masterpiece 2015. It was a tough contest between this year's speakers: Philip Mould; architect Rafael Viñoly; wine dealer Stephen Williams of AWC; Edmondo di Robilant of Robilant + Voena; and our very own prints expert Frederick Mulder. But the winner by a head was Fred Mulder and our Matisse 'Apollinaire' cut-out. To listen to the debate in full and for more information, please click here. Masterpiece runs until 6pm on Wed 1st July. Please do come and visit us and our cut-outs at Stand A40. You can find more information here. We are thrilled to be selected by Artnet as one of their top ten booths at this year's Masterpiece at the Royal Hospital Chelsea. As usual the calibre on every stand is incredibly high so we are particularly proud that our three striking Matisse cut-outs were selected as a highlight of the fair. 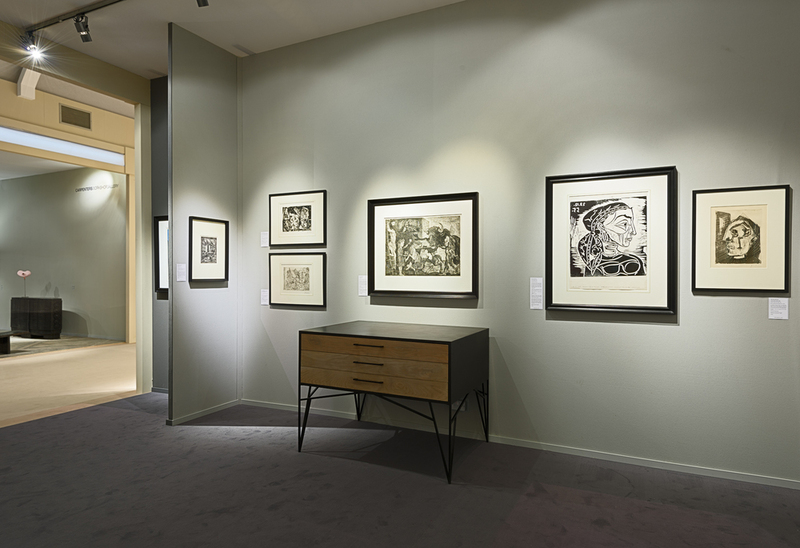 Masterpiece runs until Wed 1st July, so please do visit us at Stand A40 and we would be delighted to show you these rare works in the flesh. Spear’s have invited Fred Mulder to join them on the panel at their breakfast debate during Masterpiece London 2015, to be held on Thursday 25th June. The breakfast, sponsored by 432 Park Avenue, New York, is a lively, amusing, provocative look at art and the art world. In 2014, art dealer and gallerist Philip Mould retained his crown, beating Viscount Linley, Theo Fennell and others to have his object declared, by audience vote, the masterpiece of Masterpiece. As well as Philip, this year's speakers include architect Rafael Viñoly, wine dealer Stephen Williams and of course prints expert Frederick Mulder. For more information and the full article, please click here. Ho Siu-Bun writes in the prestigious Hong Kong biweekly magazine, 'LifeStyle Journal', about the highlights from his visit to Masterpiece 2014, dedicating a section to the Frederick Mulder Ltd stand. He draws attention in particular to our Picasso Minotauromachie and our Matisse Jazz. 'Lifestyle Journal' is a luxury lifestyle magazine distributed with the 'Hong Kong Economic Journal'. You can read the full article here.
" 到埗第一天，朋友用Whatsapp提醒我：Tate Modern正展出Matisse Cut-outs（剪紙作）！野獸派領頭人Matisse（馬蒂斯）晚年天天都在剪紙，這些幾乎是他最具童心、最爐火純青的作品，馬上去看！展覽很大型，展出都是精品，震撼很深！想不到第二天去ML傳媒預展，入場不久就看到Matisse的Cut-outs有售！而且明碼實價，嚇親我！一張42.2 x 65.1cm的原作，大概售價是8,000-1,1900英鎊不等（未連稅），即約十萬港元起跳，老實說，比起好多年輕藝術家的作品都要抵買。參展商Frederick Mulder Ltd是一家英國Gallery，藝廊總監Anne-Francoise Gavanon：「我們其實是第一年參展，我們公司由Dr. Frederick Mulder在45年前創辦，我們的專長其實是販賣歐洲名家的版畫，包括Rembrandt、Picasso等等，我們擁有一些十分有名的版畫，包括畢卡索最著名、最多人找的作品《 La Minotauromachie》。」談到Matisse的Cut-outs，她說：「這些Cut-outs，是當年Matisse替《Jazz》這本書做美術的作品，由於當時是1943年戰時，物資匱乏，到成書時，已是1947年。Matisse使用的是所謂Pochoir的Stencil技巧，《Jazz》是當年最多人搜購的一本好書。」Frederick Mulder與畢卡索的一些好友關係良好，於是，畢卡索作品也成了他們的專長，他們的客人，包括MOMA、波士頓藝術博物館，近日甚至替大英博物館購入一些畢卡索作品。"
Masterpiece London, the leading international cross-collecting fair for art, antiques and design, returns to The Royal Hospital Chelsea in 2015. Running from 25 June – 1 July (Preview, 24 June), the Fair has become a must-attend event at the heart of the capital’s busy summer art and auction season. Offering for sale museum-quality works with superb provenance from over 150 leading galleries worldwide, Masterpiece provides a unique opportunity to buy the best pieces available across multiple disciplines in the current market. Showcasing works that span over 3,000 years of art history, from antiquity to the present day, the Fair creates an unparalleled event for curators and serious collectors, and provides something of interest for every visitor. For more information, visit the Masterpiece London website here. For both new and established collectors of prints alike, www.printed-editions.com is a fabulous resource. Almost unique in its commitment to promoting original prints and editioned works, the website is supported by print dealers from around the world and showcases much of their available works spanning all periods in art history. Michael Lieberman, the man behind the website, also publishes a fascinating blog that covers everything from authenticating signatures to the latest print fairs. He also invites print experts to guest curate online showcases of works selected from the website, one of which was produced by our very own Anne-Françoise Gavanon discussing Matisse's album, 'Jazz'. You can read it here. © 2013 all the images used with permission from photographer Heather Favell , 2013.